Blackberries (Rubus spp.) belong to an extremely broad genus of plants that contains hundreds of species, many of which are commonly found in residential gardens and landscapes. Many of those species produce fruits that looks much like the fruits produced by the plants commonly called blackberries. Each of the fruits is an aggregate, a cluster of very small individual fruits called drupelets that form around a central core. Although it can be difficult to differentiate blackberry plants and their fruits from similar species and their fruits, variations in the form of the plants and fruits can provide clues that help with identification. Blackberry plants produce multiple stems called canes that have either an upright, arching growth habit or a trailing habit, in which the canes are somewhat vinelike and grow along the ground. Blackberry canes are also typically thorny, although thornless cultivars have been developed. 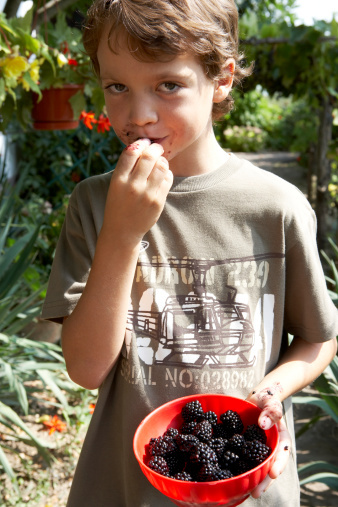 In general, blackberries are hardy in U.S. Department of Agriculture plant hardiness zones 6 through 8. Blackberry fruits are usually a very light color when unripe. As they ripen, they turn a very deep purple that is nearly black. Blackberry drupelets are shiny and smooth, and when a ripe fruit is pulled away from its cane, the fruits takes its central core with it. Raspberries produce canes and fruits that appear very similar to those of blackberries. American red raspberry (Rubus idaeus), which is hardy in USDA zones 4 through 7, is distinguishable from blackberries because its ripe fruits are red, but black raspberry (Rubus occidentalis), which is hardy in USDA zones 3 through 7, produces dark purple-black fruits. Certain differences between raspberry and blackberry fruits make it possible to tell the distinguish the two kinds of plants. Raspberry drupelets are hairy and not as shiny as those of blackberries, and a raspberry fruit separates from its central cores when picked, leaving a hollow space in the center of the fruit. Dewberry is the common name for several Rubus species that produce fruits that look like blackberry fruits. Dewberry species include the southern dewberry (Rubus trivialis), which is hardy in USDA zones 6 through 9; the Pacific dewberry (Rubus ursinus), which is hardy in USDA zones 6 through 9; and the northern dewberry (Rubus flagellaris), which is hardy in USDA zones 3 through 7. These species can be differentiated from blackberries mainly by their growth habits. While blackberry canes often reach a height up to 6 feet, dewberries remain low to the ground and may form thick mats less than 1 foot high. Some Rubus cultivars are referred to by common names other than blackberry, but their fruits very closely resemble those of the blackberry. One such plant is loganberry (Rubus loganobaccus), which may be a hybrid of Pacific dewberry and red raspberry. 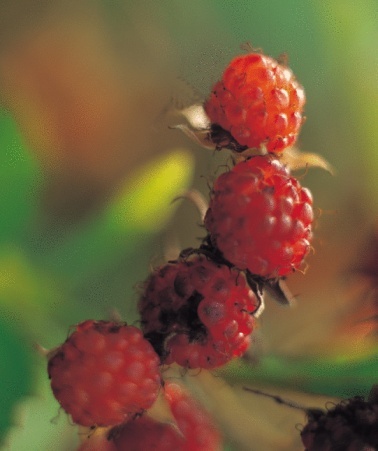 Loganberry produces dark-red, but otherwise blackberrylike, fruits. It is hardy in USDA zones 7 through 10. Mulberries (Morus spp.) are unrelated to blackberries, but they produce aggregate fruits that look somewhat like blackberry fruits. Mulberries, however, are trees that, depending on the species, can become more than 50 feet in height. Mulberries are generally hardy in USDA zones 4 through 8.